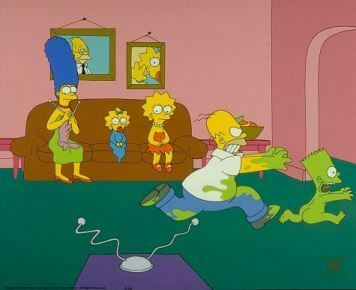 For me, this is all about the set piece: the Simpson family shocking each other in front of an increasingly freaked-out Dr. Marvin Monroe is not just one of the highlights of the first season, but one of the greatest scenes in Simpsons history. And the ending, where we see the Simpsons to be so dysfunctional that they get double their money back – enough to buy a 21" TV. Presumably to watch more of the Itchy and Scratchy Show, which makes its first appearance. That said, the reason for the visit to Dr. Monroe – outside of the fact that Homer liked his commercial best – Marge, Lisa & Bart misbehaving during the picnic at stately Burns Manor, is at odds at what we later know about those characters. Well, not Brat, of course (or Maggie, who already is a silent comedic genius), but Marge’s silly drunkeness, Lisa’s rambunctiousness and Homer’s concern are mostly in the service of getting them to the point where they think they need to see Dr. Monroe, as opposed who those characters end up being. And so what? In 1990, none of that mattered when I was falling down laughing as the shock scene escalated. Written by: Jay Kogen & Wallace Wolodarsky. Despite the first appearance of one of my all-time favorite Simpsons tropes: one the Simpsons addressing a mob during the climax of the episode, “Homer’s Odyssey” is pretty weak sauce. Still, fun to watch, of course, for the weird early characterizations: Moe with jet-black hair! Homer with dark stubble! 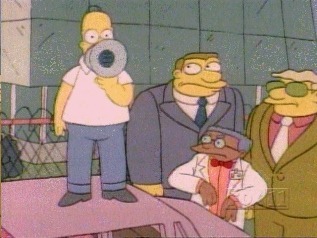 Black Smithers! But even Smilin Joe Fission couldn’t save this ep. “Bart’s behavior is … unruly” – Principal Skinner. In a weird way, “Bart The Genius” is the first proper episode of The Simpsons. So many firsts here: theme song, chalkboard gag, couch gag, Mrs. Krabapple, Skinner, etc. Loads of world-building, and a clear emphasis on Bart being positioned as the initial breakout character. Also, Millhouse has black hair!! I’d forgotten how many P.O.V. shots of one person getting right into another person’s face there were in these early days. On the other hand, I’m still waiting to play “KWYJIBO” in Words With Friends. People forget that Matt Groening was already a household name (in certain households) and the shorts had been running on the The Tracy Ullman Show for a couple of years, so – to some of us – this very first episode was highly anticipated. However, the night it aired was also the night we moved the Video Zone Store 1 from one location to another, so I taped it and watched it the next day.Thus beginning a regimen of taping and saving every Simpsons episode. It made sense of course: like Police Squad!, there was simply no way that The Simpsons would last more than a few episodes. So I needed to have every episode to watch over and over again forever. 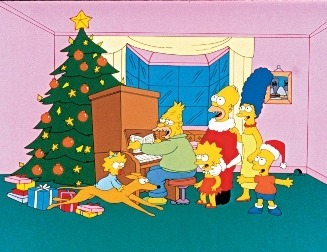 25 years later, of course, this episode seems funnier than it did at the time, but weird: none of the voices are quite right, and the specificity of parodying a Christmas episode – even when they called out other Christmas episodes – meant they couldn’t quite tap into the freewheeling anarchy that eventually became their calling card. That said, how many other Christmas episodes made their happy ending feel like a twist ending?